The three skyscrapers known as International Towers and Westpac Place, in the inner city suburb of Barangaroo. 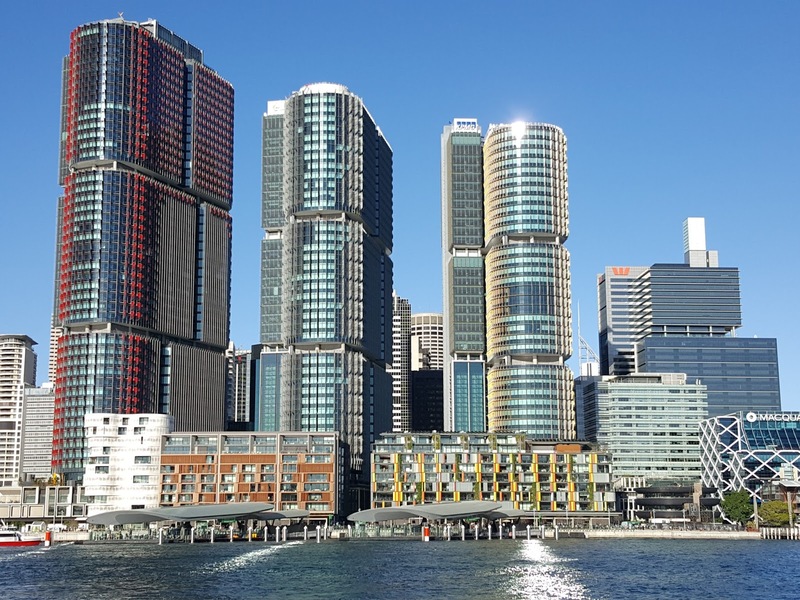 The apartments in the foreground are along Wulugul Way behind Barangaroo Wharves. The afternoon sun is reflected across Darling Harbour, viewed from Pyrmont. These are quite attractive and what a view! But I'll bet they are very pricey, also! They are quite a commanding presence. They must be the most photogenic trio of buildings in Sydney. p.s speaking of architecture, are you going to Sydney Open? Valerie, I went a couple of years ago. I wouldn't mind going again. Excellent shot! Love the modern buildings! Great architecture here. Like the rounding in the facades and the dividing in heigh by the congestion.